# The Treasurer is telling some amazing fairy tales which he has repeated in this self-serving, self-assessment of the 100 Day Plan. There is a K14 billion broken promise that there would be no more tied financing yet that is what the government has done with its latest China deal. “The 100 Day Plan from Treasurer Abel is a failure. Fundamentally, the plan was to re-build confidence that the government would fix the economy. Unfortunately, the fake 2018 budget, especially its K2 billion in fake revenue, means the plan has not restored confidence. The 100 day plan is fatally flawed because if fails to provide credibility. When examining the details of the plan, it also fails in many of the claimed accomplishments. Fairy tales are being told to the people of PNG” said the Shadow Minister for Treasury and Finance, Ian Ling-Stuckey. “The Alternative Government has gone through the fake promises of the 100 Day Plan line by line and compared them to the bed time stories being told by the Treasurer in yesterday’s Post Courier article. In a spirit of expose, oppose and propose, we have prepared a detailed table that examines the promises of the plan. While there have been some welcome accomplishments, generally the 25 points in the plan have either failed or there is simply not enough information to judge if the plan has had any impact. “As I have pointed out several times since the 2018 Budget, the Treasurer is telling some amazing fairy tales which he has repeated in this self-serving, self-assessment of the 100 Day Plan. There is a K14 billion broken promise that there would be no more tied financing yet that is what the government has done with its latest China deal. There is a K1.6 billion broken promise of extra debt over and above the 30% debt to GDP ratio promised in for his 2017 Supplementary Budget. There is K408 million in lower revenues in 2017 that will flow through to higher deficit in 2017 and higher debt in 2017 – facts that he hid in his Budget Speech. There is a broken promise not to cut funding to Wards” said the Shadow Treasurer. “In addition to hiding the true state of the economy, he has also not told the whole truth. Where in his 100 Day Plan did he announce that tariffs on milk and butter would increase by 25 per cent? Where did he tell everyone that fuel prices would jump 15%? 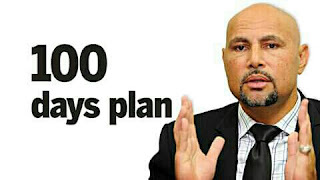 Where did he tell the people of PNG that he was going to increase prices on hundreds of day to day products? There are better ways to get jobs and increase incomes for the people of PNG than these costs increases which hurt ordinary families and businesses” said Mr Ling-Stuckey. “So what is the Treasurer going to do now? Will we have another 100 Day Plan or does he need more time for a 200 day plan? Given the failures of this current plan, possibly he would be better off honestly responding to the factual criticisms of his budget and his existing plans. He would certainly be better off reading some of the Alternative Government policies on how to actually deal with the budget crisis, the foreign exchange crisis and the jobs crisis facing PNG. And frankly, given how bad things have become, we really need to start reaching out more for friendly foreign support. This will mean having to take some hard medicine, but we owe it to our children and their children to start re-building this proud country of ours. “In the spirit of Christmas and the promises of a better New Year 2018, I do hope the Treasurer will be more open and responsive. The Alternative Government wants to work together to try and stop MV PNG hitting the Lemus reef! And the starting point for finding a solution is to admit that there are problems and admitting when mistakes have been made, including those in the fake 2018 budget and this failed 100 Day Plan” said Mr Ling-Stuckey.